The enthusiasm for pigeons with oversized beak and eye wattles is not so much in active fanciers of racing homers, but in fanciers of 'beauty homers'. In many cases, these really do hold them for the original messenger pigeons, although there was never a messenger pigeon with such large wattles as some of the beauty homers today. The strain of racing homers, with which the author in his youth competed at the first races, still based on chicken feed, also tended to stronger nose wattles (Fig. 1). However, these were never dimensioned as they are today sought by some so called beauty homers with reference to the alleged ancient tradition as carrier pigeons. If one sticks to the facts, then neither the Belgian racing homer, which essentially goes back to high-flyers and rough owls, nor the "Turkish pigeon" as historical messenger pigeon (carrier) of the Orient possessed an excessive wattling. 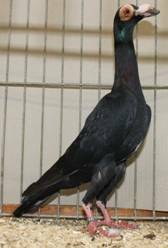 The reference to the old messenger pigeons may be promotional for some exhibition breeds, however, it is not correct as justification for extreme wattles. Gessner (1555 and 1557) and Aldrovandi (1600, 1610) still do not mention messengers or wattle pigeons in their descriptions of breeds. Only in the enlarged version of the ‘Gessner’ by Horst (1669, p. 178) are they mentioned in the German-speaking world as 'Dückmäuler' (thick moulth) from Frankfurt. On the upper beak they would have a 'warty proliferation' and warts around their eyes. Both would increase with age. They are difficult to get used to, and it is the say, "that they fly back from 40 miles to their proper place and are therefore often served in sieges of theirs as messenger or letter carrier." At about the same time, 'carriers' were described as carrier pigeons in the Turkish Empire by Willughby 1678 similarly: size of the ordinary pigeon, the beak of moderate length, the eye framed by bare skin and on the beak a double crust like skin (Fig. 2). 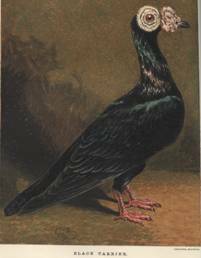 The description was made not only by hearsay, because such pigeons would have been seen in the Royal Aviary in St. Jame's Park and at another point in London. 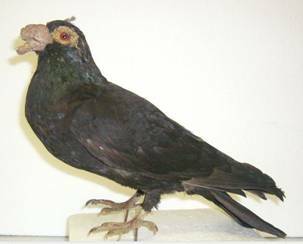 No indication in both sources on an extreme wattling, which also covers the lower beak. 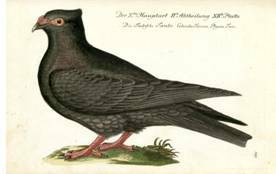 Willughby also mentioned 'Barbary Pigeons', which run in Germany as ‘Indianer’. The beak is short and thick as in the owls (turbits), the eye cere as the carrier. The eye color is white, but there were also reports of red eyes. Drawings of the Turkish Pigeon can be found at Frisch 1763 and Neumeister 1837 (Fig. 3). Pigeons with very strong wattling, appeared only in the first monograph on domestic pigeons by the London pharmacist Moore (1735) in the description of his carrier. The wattling at the upper beak would be accompanied in this sometimes by two excrescences on each side of the lower beak. In his time was already bred on beauty attributes to a standard. His carrier was much larger than the ordinary pigeon, the beak long, straight and thick, the neck long and thin. Pictured is the ideal in 1765 in the Treatise. Impressive also the picture at Tegetmeier 1868 (Fig. 4). 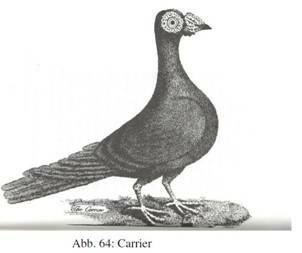 Little resemblance to the description of the original carrier at Willughby and with the early pictures of the Turkish Pigeon! Brent (1871) probably rightly suspects that the changes in the neck and beak length were due to early crossings with French bagdettes. The increase in the wattling may have been achieved by selective breeding and the use of mutations in the desired direction. 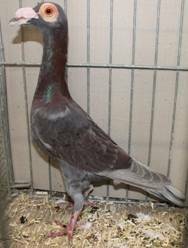 Overall, an impressive breeding performance: For Moore and his friends, the English carrier was the king of pigeons on the account of beauty and great sagacity. To prove sagacity an impressive legend was needed. Moore created that by transferring the history of the old 'carriers' of the Orient to his now significantly changed exhibition carrier. Identity theft we would call it today. Besides Tegetmeier, other early authors, such as Selby (1843) and Fulton (1878), pointed out that his carrier had already moved far from a messenger pigeon. To quote Tegetmeier: The name carrier was regrettable, since one could not attend a show without anyone who was deceived by the name speaking of them as the true messenger pigeons (Tegetmeier 1868, p. 44). That does not deny the attractiveness. Even Darwin (1868 Chapter VI) mentioned “the Carrier with its wonderfully elongated beak and great wattles, the Barb with its short broad beak and eye-wattles” that were developed, however, from predecessors with beaks and wattle incomparably less developed (ibid). 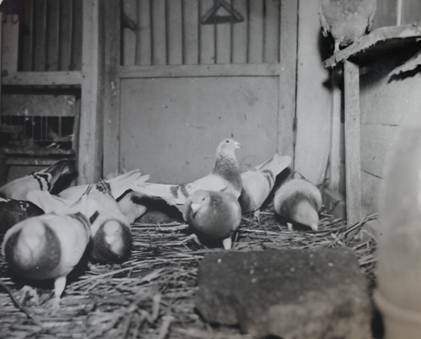 As an exhibition pigeon, the carrier conquered the world starting from England. Also the heavily-wattled short beaked English 'Barbs' became a figurehead of English breeding art and were to be found as ‘Indianer’ of the English type in Germany at the exhibitions until the 1960s. Fig. 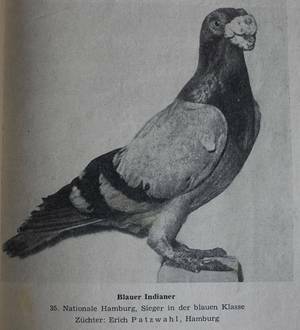 5: Barbary Pigeon of the old type in Germany, champion at the German National Hamburg 1953 (Taubenwelt 2/1954). An example of an English carrier before 1900 is preserved in the Natural History Museum in Braunschweig. Labeled is it as 'bagdette'. This is because the English carrier in Germany was also called 'Long Beaked Bagdette' (in contrast to the Nuremberg Bagdette). 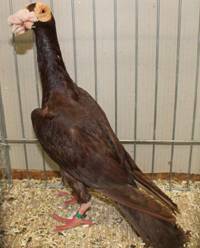 It was donated in 1887 by Hugo du Roi, then president of the Club of German and Austrian-Hungarian Poultry Breeders. With the English carrier, the myth of the English carrier spun by Moore as an ancient messenger pigeon was evidently transferred to other countries and the heads of admires. That should be the background for the presentation of similar pigeons as old Polish and old Hungarian pigeons as well as Italian beauty pigeons. Rather embarrassing that one can still read in the German standard, that the English carrier was an ancient messenger pigeon of the Near East and North Africa. A sustainable marketing of Moore, which also today's marketing experts will have to concede! It is an open question whether the wrong statement of the English carrier's past as a carrier pigeon today is positive for the breed. Probably one would perceive the features of the English carrier in terms of neck and leg length, the sloping stand and the peculiarities in head shape and beak even better, if there were not the permanent comparison with the homing pigeon in the background. Wattle pigeons have had followers for about three hundred years now, and will continue to have them, even without the mistaken claim of a past as a messenger pigeon. 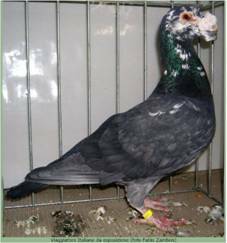 Thus, we should accept that many of the pigeons today propagated nationally and regionally as old messenger breeds are in the tradition of the exhibition carrier and early forms of the English Barbary Pigeon and not in that of true homing pigeons. Anonymous, A Treatise on Domestic Pigeons, London MDCCLXV (1765), Reprint Chicheley, Bucking­hamshire 1972. Brent, B.P., The Pigeon Book. Containing the Description and Classification of all the known Varieties of the Domestic Pigeon, with numerous highly-finished Illustrations, third edition London (1871). Gesner, Conrad, Vogelbuch, Frankfurt am Main 1669, aus dem Lateinischen mit Verbes­serungen durch Geor­gium Horstium, Reprint Schlütersche Verlagsanstalt und Druckerei Han­nover 1995. Selby, P.J., The Naturalist’s Library, edited by Sir W. Jardine, Bart., Vol. XIX. Ornithology. Pi­geons, Edinburgh 1843, (preface 1835).